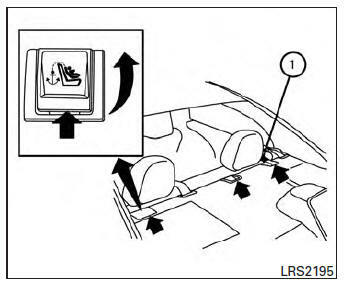 Attach LATCH system compatible child restraints only at the locations shown in the illustration. 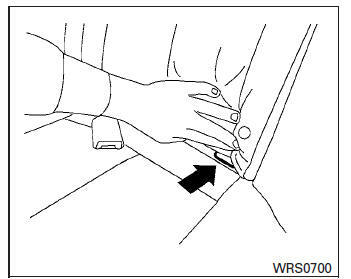 Do not secure a child restraint in the center rear seating position using the LATCH lower anchors. The child restraint will not be secured properly. Inspect the lower anchors by inserting your fingers into the lower anchor area. Feel to make sure there are no obstructions over the anchors such as seat belt webbing or seat cushion material. The child restraint will not be secured properly if the lower anchors are obstructed. The LATCH lower anchors are located at the rear of the seat cushion near the seatback. A label is attached to the seatback to help you locate the LATCH lower anchors. LATCH compatible child restraints include two rigid or webbing-mounted attachments that can be connected to two anchors located at certain seating positions in your vehicle. With this system, you do not have to use a vehicle seat belt to secure the child restraint. Check your child restraint for a label stating that it is compatible with LATCH. This information may also be in the instructions provided by the child restraint manufacturer. When installing a child restraint, carefully read and follow the instructions in this manual and those supplied with the child restraint. Child restraint anchorages are designed to withstand only those loads imposed by correctly fitted child restraints. Under no circumstances are they to be used to attach adult seat belts, or other items or equipment to the vehicle. Doing so could damage the child restraint anchorages. The child restraint top tether strap must be used when installing the child restraint with the LATCH lower anchor attachments or seat belts. See “Installing top tether strap” in this section. 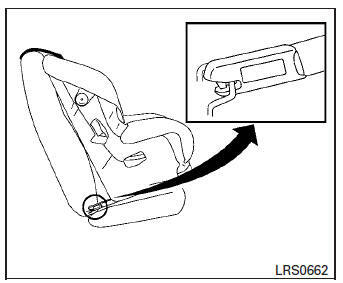 If you have any questions when installing a top tether strap child restraint, consult your NISSAN dealer for details. Anchor points 1 are located on the rear parcel shelf.